Help us get out the Republican vote! It’s been a long time since CD5 has promoted our candidates with a voter guide. Many Republicans voters only vote presidential years and if we can encourage them to vote this year, it can make a huge difference in a gubernatorial year. This is an ambitious goal costing $15,000. Any size donation helps, whether it’s $5 or $500. 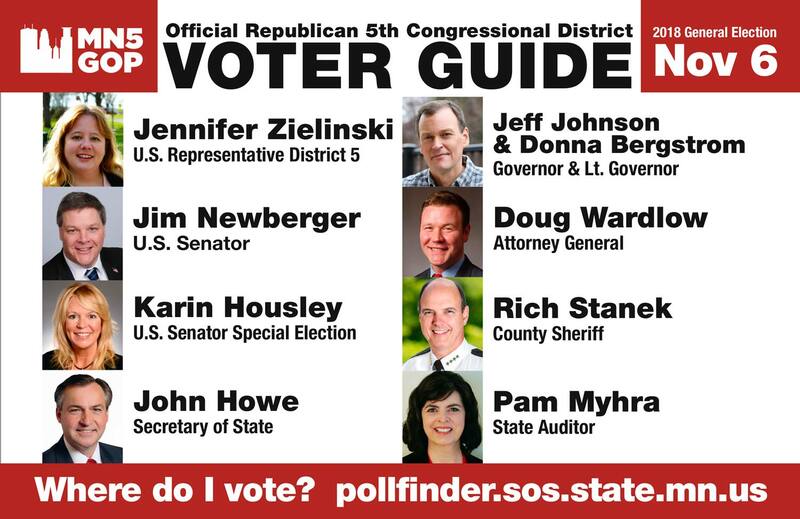 This is expensive, but a proven effective marketing tool that will help all our candidates: Jeff Johnson, Karin Housley, Jim Newberger, Pam Myhra, Doug Wardlow, John Howe, Sheriff Stanek and of course Jennifer Zielinski. We need your support, your assistance and yes your checkbook. Donate to MN5 and Help Us Get out The Republican Vote! How do I vote Early? Early voting for the Minnesota General Election has begun! Watch this video from the Secretary of State on how to vote by absentee ballot. Before you can vote, you must register. Details for registration are listed below, but you can also use the Secretary of State’s web site to register online. Look up whether or not you are registered here on the Voter Information Portal. You may register to vote by completing a Voter Registration Application and submitting it by mail or in-person to your local election official. Once you’re registered, you will receive a postcard with information about where you vote (your polling place) and your name will appear on the list of voters at your polling place. It takes some time to put the list together, so if you haven’t registered at least 21 days before the election, you can register at the polling place on Election Day. If you are not registered to vote or need to update your registration information, you may do so at your local polling location on Election Day as long as you can provide proof of residence. To find out where to vote on election day, click here. There are two ways to vote by absentee ballot: in person and by mail. You may cast an absentee ballot in person, at your county auditor’s office and in some cases your city or township clerk’s office, starting 46 days prior to Election Day. This option is available on weekdays during business hours. In addition, the county auditor’s office must be open for absentee balloting from 10 a.m. to 3 p.m. on the Saturday before the election and until 5 p.m. on the day before the election. In order to vote absentee by mail, you need to complete an Absentee Ballot Application and submit it to your local election official by mail, fax, or email (print off the application, sign it, scan it, and attach to an email as a .pdf). More details or apply on line here.